This note contains the main elements of a presentation delivered by Gordon Judge at a seminar on 29th September 2017 organised by Smith & Williamson for members of defined benefit pension schemes. On first impressions, a defined benefit (DB) pension scheme is the best type of pension you can have. It promises a pension based on a percentage of final salary. Planning for the future is easy. But – and there always is a ‘but’ – this all depends on the scheme’s ability to fund its pension obligations for all members. The viability of schemes may be affected by lack of employer funding, low interest and bond rates and poor investment performance. As we all live longer and healthier lives, pensions must last longer. Many schemes are being closed off to new members. For those that continue, the trustees must consider if they can meet their obligations, firstly, to those members who have retired and, secondly, to those members who have yet to retire. Benefits under DB schemes are not guaranteed. If the scheme’s assets are not sufficient to pay the benefits and the employer is not in a position to meet the shortfall, promised benefits may have to be reduced. If you are lucky enough to have your DB scheme backed by a deep-pocketed multinational company, or have a state funded pension, your comfort in retirement remains pretty certain. However, for many established employers, the prospect of continuing to fund a DB scheme for an ageing workforce can be daunting. The article went on to discuss a report from the Pensions and Lifetime Savings Association, an industry body. It talked about final salary or defined benefit pension schemes coming under funding pressure and the inability of the UK Pension Protection Fund, a so-called lifeboat service for insolvent funds, to meet the full pensions liabilities. Both defined benefit (DB) and defined contribution (DC) schemes are usually set up under a trust. The trustees hold the scheme’s assets for the sole purpose of providing retirement benefits for members. A pension trust is what I like to call a “purpose trust”. Members must satisfy the rules and conditions of the scheme to qualify as beneficiaries and draw benefits. The purpose is the provision of retirement benefits for those members who qualify. The trust exists independently of the employer so as to ensure that the assets are protected whether or not the employer stays in business. Who are the relevant parties? o Trustees – who hold the scheme assets. o Employers – who have established the scheme and have certain obligations to fund it. o Deferred members – are people who have left the scheme but who have not reached retirement age or taken a transfer of benefits to another scheme. o Active members – These are people still working in the qualifying employment. o Actuary – The individual appointed by the trustees of an occupational pension scheme to carry out valuations and advise on funding matters. Two other bodies are also relevant, namely the Pensions Authority and the Pensions Ombudsman. The Pensions Authority is the regulatory body for occupational pension schemes generally and PRSAs. What does the Pensions Authority do? • The Pensions Authority monitors compliance with the Pensions Acts. • It provides information to trustees and members. o It can represent members who are concerned about their schemes. o Investigation. The Pensions Authority can investigate the status and conduct of an occupational pension scheme. o Prosecution. It can prosecute for breaches of the Pensions Acts and frequently posts on its website notes of prosecutions of employers for failing in their responsibilities. o Court actions. It can also take other court actions against trustees for the protection of members and their rights. The Pensions Ombudsman investigates complaints concerning occupational pension schemes and PRSAs. The Ombudsman has the power to give directions to help resolve a dispute between trustees and members. The Ombudsman can award compensation, but this cannot exceed the actual loss of benefit. Before making a complaint to the Ombudsman, the dispute must first have gone through the Scheme’s own internal disputes resolution procedure (IDR). All pension schemes must operate a disputes procedure. Trustees must obtain an actuarial funding certificate for each DB scheme every 3 years and submit it to the Pensions Authority. Its purpose is to verify that the scheme meets the required funding standard as at its stated effective date. The required funding standard for DB schemes is described in section 44 of the Pensions Act 1990. A scheme meets the required funding standard if, in the opinion of its actuary, the resources of the scheme at the effective date would have been sufficient, if the scheme were wound up on that date, to provide for the liabilities of the scheme and the estimated expenses of administering and winding up the scheme. (i) Future benefits payable to pensioners. (ii) Preserved benefits. Preserved benefits are benefits deriving from AVCs or benefits transferred in from another scheme. (iii) Benefits payable to deferred members (people who have left service) when they reach retirement age. (iv) Accrued benefits payable to active members assuming they left service at the effective date. The scheme must also hold a risk reserve. The actuarial funding certificate (AFC) indicates whether or not, in the opinion of the actuary, a pension scheme could meet all liabilities and expenses, were it to be wound up on the effective date. If the actuarial funding certificate indicates that the scheme does not meet the required funding standard, the trustees must submit a funding proposal to the Pensions Authority. The funding proposal should explain how they propose to deal with the deficit over the next three years. The funding proposal should contain measures to ensure that the scheme could reasonably be expected to satisfy the funding standard at the effective date of the next funding certificate – i.e. within the next three years. All parties must sign up to the funding proposal. c) the trustees submit it to the Pensions Authority accompanied by the funding certificate to which it relates. then the trustees may apply to the Pensions Authority for directions. The Pensions Authority may direct the trustees to reduce benefits for employed members. Any reduction in benefits should be such as to ensure that the scheme will, once the reduction is made, satisfy the funding standard immediately following the reduction. The trustees have a duty to notify members of the reduction in benefits within two months. Within a further one-month they must submit details of the reduction in benefits to the Pensions Authority with as actuarial funding certificate showing that the scheme now satisfies the funding standard. Most trust deeds contain their own procedures for making amendments to the terms of the scheme. 4) Where the employer notifies the trustees that it intends to stop contributing to the scheme. Some of you may have read about the collapse of the BHS scheme in the UK and the whopping £363 million (pounds) cash settlement made on behalf of Sir Philip Green’s family, the former owners of BHS. BHS (formerly British Home Stores) went bust in 2016 with a huge pension deficit. This happened just a year after an investment company called Taveta Investments, controlled by Sir Philip’s family sold it for £1 to a new company led by a former bankrupt. In its report on the BHS scheme, the UK pensions regulator argued that, through the sale, Sir Philip had tried to wash his hands of the failing BHS, so its pensions would not be his problem when BHS inevitably went bust. Under the principle of limited liability, the investment company and Sir Philip would not be liable for BHS’s pensions simply by virtue of share ownership. The regulator needed to show BHS was so integrated with Taveta Investments that, in economic and practical terms, BHS was really just a division of Taveta and not an arm’s length subsidiary. The regulator had successfully done this following Lehman Brothers’ bankruptcy in 2008 and had showed that, although Lehman UK was a separate entity, it operated as an integrated division of Lehman US, allowing the UK pension scheme to claim a share of the company’s worldwide assets. Sir Philip Green was a “key decision maker” in both BHS and Taveta. He was personally involved with BHS pensions for many years, both before and after BHS was sold. While there were clear flaws in the regulator’s case, Green settled. It is suggested that this may have more to do with Sir Philip’s ego than the strength of the case. Back to Ireland and the technical stuff…. When schemes are wound up, the order of priorities for distributing funds will differ depending on whether the scheme is insolvent or the employer is insolvent, or both. The winding up order is set out on the slides. The trustees will work through this sequence in making alternative pension arrangements for members, usually until they reach the point that the fund runs out, assuming there is not a surplus. Where a scheme does not have enough funds to pay 50% of pensioner and future pensioner benefits up to €12,000 a year, the Minister for Finance must provide the necessary funding. This is our lifeboat. • transfer each member’s benefits to a PRSA. Not all DB schemes will be insolvent on winding up and, once the trustees have discharged all of the benefits and liabilities of a scheme, any surplus may be distributed according to the trust deed and rules so as to enhance benefits to members. If a pension scheme does not have enough funds to pay members their benefits the order of priorities on winding up that I have just mentioned will determine how trustees reduce benefits. There have been a couple of notable Irish cases dealing with the funding of pension scheme deficits by employers. In The Omega Pharma case, the trustees successfully claimed almost €2.5 million in deficit contributions from the scheme’s employers. In that case, it was determined that the trust deed and rules of the scheme, and not the Pensions Act minimum funding standard, governed the employer’s liability to contribute to a DB scheme on winding up. The employer was required to make a once off lump sum payment to fund the deficit after the employer had given notice to wind up the scheme. The trustees had requested the lump sum before the period of the notice of winding up had expired. The court found the lump sum to be payable under the terms of the trust deed. The Element Six case provided the first Irish judgment on the duties of trustees and employers on termination of a DB scheme. It this case, the trustees had declined to make a contribution demand of the employer. The case involved the closure of the former De Beers Diamonds facility in Shannon. The employees were unsuccessful in their claim against the trustees for breach of trust in accepting what the employees felt was too small a contribution to fund the deficit. The company had offered to pay a contribution of €37 million in winding up the pension scheme. The beneficiaries argued that at least €129 million was required to make up the funding deficit. The court found that the trustees had acted reasonably in the circumstances of the winding up in deciding not to serve a contribution demand. They needed to strike a balance between their obligations to the scheme and the practical realities facing the company. • The trustees must give new members basic scheme information in the form of an explanatory letter or memorandum. • Members must be notified of all material changes to the scheme within four weeks. For changes that will affect accrued benefits, the trustees must notify all members of DB schemes (active, deferred and pensioners) of any proposed benefit reductions. • Members must receive annual personal benefit statements. • Annual reports must be prepared for all pension schemes (other than one-member arrangements). Reports on DB schemes must also include actuarial statements on the funding position of the scheme. 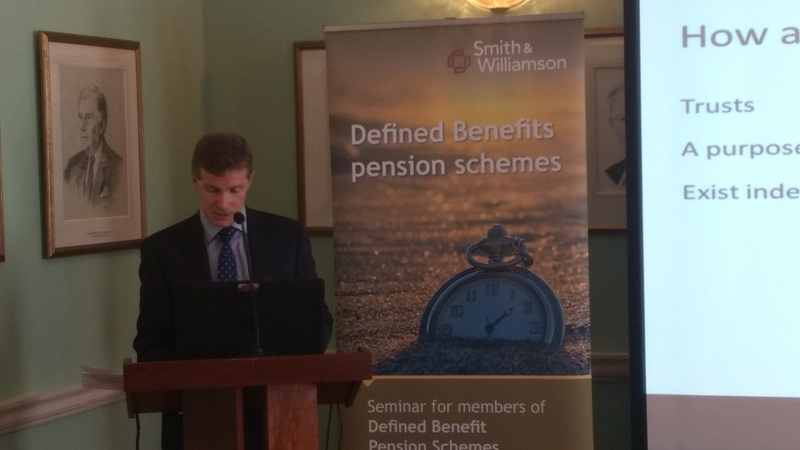 Members of DB schemes should make sure that they are provided with all such information so they can fully consider the future viability of their DB scheme and the likelihood of promised benefits still being there when they reach retirement. After the family home, pensions probably represent the most valuable asset that is likely to be divided on separation. However, because many family lawyers are not familiar with pensions law, pensions are often added in as a final or a last-minute item in separation or divorce proceedings and are all too frequently described or dealt with incorrectly, leaving trustees unsure how to respond. Proper expert pensions advice is essential. Our firm often advises pension trustees who have been served with a contradictory or an unenforceable order in relation to pension assets. A firm such as Smith and Williamson may be involved in helping with this difficult process too. A pensions adjustment order may be made by the court, ordering the trustees of a scheme to pay a proportion of the pension benefits to a spouse of a member. A right to information about a spouse’s pension benefits does not come automatically and may require consent or a court order. Pensions are a politically topical issue. In May, while still Minister for Social Protection, Leo Varadkar published the General Scheme for a proposed Social Welfare and Pensions Bill 2017. The initial bill issued in July. As Taoiseach, in a speech at the IBEC dinner in September, he announced that a scheme to reform pensions will be published before the end of this year. This is to include some form of auto-enrolment pension system, with a portion of every private sector worker’s pay automatically directed into a pension fund. • The Pensions Authority were to be given a power to impose contributions on employers which would be deemed to be debts due from the employer to the trustees that can be recovered in a court action. These aspects did not feature in the initial bill but, with pensions being a ‘hot topic’ for politicians at the moment, additional restrictions on the winding up of DB schemes may appear as the bill passes through the Oireachtas. Employers with funding concerns are now on notice that it is likely to get more difficult to wind up DB schemes, so this may provide an incentive for some to wind up sooner rather than later. While DB scheme benefits are far from secure or certain in all cases and the number of DB schemes has fallen significantly in recent years, there is a political will to control their demise going forward. In response to media attention and the publicity around DB schemes in Aer Lingus, AIB and independent Newspapers, we are likely to see more measures to limit the ability of solvent employers to wind up DB Schemes that fall below a certain funding level. Some may be thought to be too big to fail. However, the money to meet any such requirements must still exist to give members of DB schemes the certainty of knowing that their scheme will be able to fund their retirement. Longer term concerns about the viability of DB schemes are likely to result in further migration of funds to DC (defined contribution) schemes and other pension products. The certainty that members once felt about having a defined benefit/’final salary’ pension has gone for most in the private sector and it is tempting to take now what you know you have – ‘a bird in the hand’ so to speak.